I really enjoyed reading your perspective.After some years being involved with both Catholic and Evangelical Christian communities, I have heard my share of opinions that suggested I was less of a Christian or even worse not a Christian for practicing my faith in a particular manner. I would challenge you to use these times as opportunities to both reflect on your own beliefs and engage in some kind of discussion(both of which you seem to be doing with this entry). What I have come to find is that on both sides of the tracks there exists a narrow understanding between Protestants and Catholics and a desire, especially from younger folks to understand each other. As far as i am concerned; what makes us Christian is not about how we practice our faith, its about what lies behind our intentions. Growing up a non-Christian in this country led to some... interesting... experiences. One that comes to mind is something that happened to my sister. Growing up, she used to baby sit for some of the neighborhood families. One day, when she was ~13, she came home in tears. Somehow the fact that my sister wasn't Christian came up in conversation with the little girls - the older one was ~5 then - she was baby sitting, and they broke down in tears, because they really liked her, but they'd just learned that only Christians can go to heaven. They spent the rest of her time there trying to convert her. It made things very stressful and confusing for my sister until the parents came home, and she could escape back home - across the street. To this day, the memory of my conversation with her when she got home leaves me with very mixed feelings. What the girls were doing was kind of sweet... but was it misguided? I mean can you really expect parents and/or Sunday school teachers to teach kids 5 and younger this sort of nuance? or do you teach them doctrine, and then teach them nuance when they're older? I am not personally a big fan of religious proselytism. I don't like to be on the receiving end of it. On the other hand, I do love discussing religion and faith... I just get very uncomfortable when the line is crossed between passionate discussion and proselytism. I guess the answer here may found in the foundation on which one,s belief is based. First of all - thanks for bringing this up and examining your feelings, and being willing to share that with us all! I sympathize with you about your experience - Hopefully they are well-intentioned, but it can be just downright annoying. I wish I knew how to share my faith better - Jesus seemed to attract people like a magnet - they wanted to be close to him. And he also knew how to offend those who were religious. I'm reading Luke right now and boy - did he know how to piss people off! Yet he also showed amazing compassion and taught radical love and forgiveness. You brought up the idea that Christians shouldn't dictate who does and doesn't go to heaven. I agree. I think God does that. For me, the whole "Jesus is the only way to God" argument is very uncomfortable. I wish God just took in everybody. But what it comes down to for me is the question: Is God who I dictate him to be, or is he who he says he is? If I honestly believe that he is who he says in the Bible, then I don't have a choice. It's right there, in a bunch of passages. I can't believe in many ways to God just because it makes me feel better or makes me more comfortable. If I want a God bigger than my imagination, then I have to let go of trying to get him to follow my personal agenda.... which leads back to evangelizing. Because if I honestly believe that Jesus is the only way to God, if I really believe this is true, then I'd really be selfish not to tell other people about the amazing way he rescued me. As I said, I wish I knew how to be more like Jesus - to reflect his kindness and love, in a way that made a difference to those around me and made me want to know the reason why. Anon #2: Thank you for sharing with such sincerity and honesty! You raise some very interesting points. 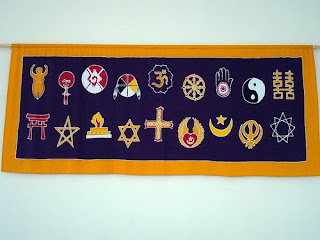 Along your line of thinking, I'm curious to know how other sacred texts in non-Christian faiths come in -- for example, the Torah and Koran purport to show who God is as well. So why would the New Testament be definitive? Would love to hear your (and anyone else's) thoughts!